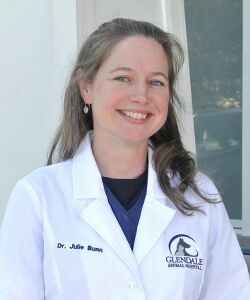 Dr. Julie Bunn is a 2005 graduate of Ohio State University of College of Veterinary Medicine. After practicing in another suburb of Chicago, she joined the Glendale Animal Hospital team in 2008. Dr. Bunn enjoys all the variety that veterinary medicine offers, but has a particular interest in feline medicine, geriatrics and internal medicine. She has two very spoiled cats, Mona and Divot, who share their home with her. When not in the office, Dr. Bunn enjoys traveling, visiting national parks and anything that gets her outdoors.